The full trailer for the live-action adaptation of The Lion King has been released and it looks faithful to its predecessor. Anyone who grew up watching the animated classic will surely get a heavy dose of nostalgia as they watch this trailer. The clip opens with voice-over from Scar (Chiwetel Ejiofor) as he laments the injustice of life while we watch scenes of young Simba and Nala’s fateful trip to the elephant’s graveyard. There are ominous shots of Scar himself, surrounded by his hyena underlings. This CGI version of Scar is more realistic and does not keep the iconic black mane and dark brown color of the animated film. But he looks gaunt and distinctive enough from his brother to signal to the audience that he is up to something sinister. The scene shifts to a brighter view of the glorious savannah, with the benevolent voice of Mufasa (James Earl Jones) teaching his young cub (with a bonus glimpse of Zazu!) about the true meaning of being a king. The rest of the trailer then shows us the rest of Simba’s journey in brief glimpses, like the arrival of a stampede of wildebeests, a reunion with an old friend by a waterfall. The majestic original score plays throughout the trailer, awakening all our memories of watching a cub become a king. The sequence where he, Timon, and Pumbaa walk together until Simba grows up is taken, practically frame by frame, from the original film, and it is a wonder to behold and does fill one with nostalgia. We also get our first glimpse of Timon and Pumbaa, and if you watch the trailer till the end, you even get to hear them humming a familiar tune. 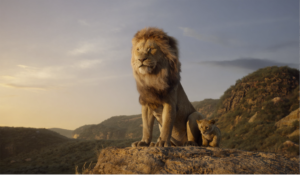 As previously reported, the film boasts of an all-star voice cast including Donald Glover as Simba, Beyonce Knowles-Carter as Nala, Chiwetel Ejiofor as Scar, Billy Eichner as TImon, Seth Rogen as Pumba, Alfre Woodard as Sarabi, John Kani as Rafiki, and James Earl Jones reprises his iconic role as Mufasa. Don’t miss The Lion King when it opens in theaters on July 19, 2019.